Shawn met Geartsje in Holland, and was blown away. We are so EXCITED!! This girl can motor, and she is super athletic. She went to the central mare keur as a 2 yr old and was awarded 1st premie and placed 3rd of her two year old class. A superb showing! She has top of the line bloodlines. 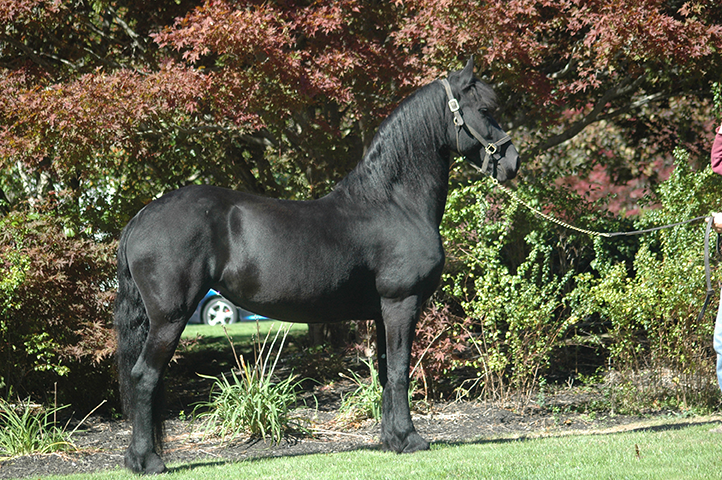 3x Stallion Show Champion, Norbert is her dad, and many time Stallion Champion, Jasper is her grandfather - what a combination! She also has Oege preferent thrown in there, just for good measure. Her mare line is ster, ster, ster+pref, ster, from stam line 70 with a low inbreeding coefficient of 1.56%. 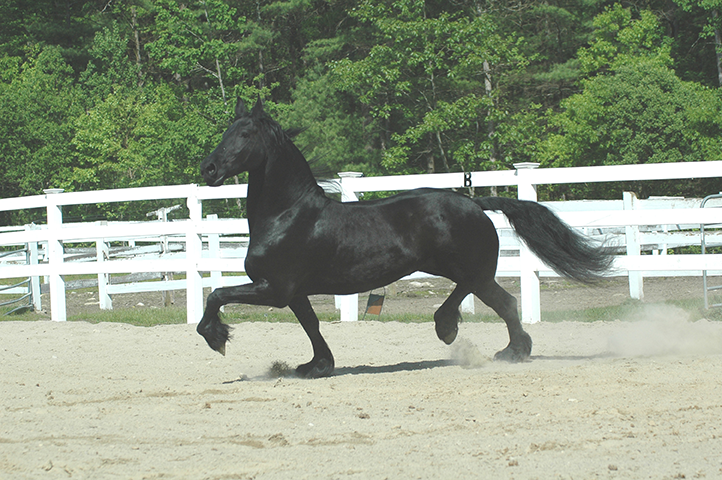 Owned and loved by Susan Ryan and Hennigan Friesians. Champion of the Keur and Provisional Kroon! 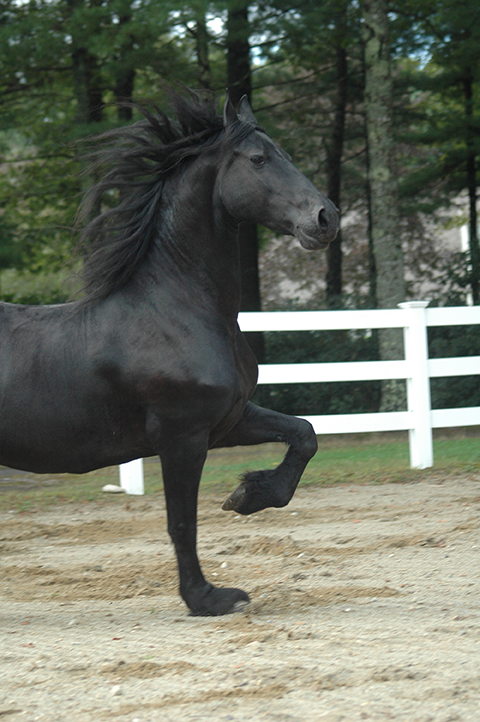 1st premie Ster mare born May 5, 2000, imported as a 3 year old for sale, but never left Hennigan Friesians. Everyone fell in love!!! She is a very expressive mare, with unique and distinguishable eyes. She is a super mover, with a lot of power in her hind end and amazing forward propulsion. She is also very smart, and extremely sweet. She loves to give hugs, by putting her head over your shoulder and pulling you in! She is an amazing mother. She has a very low inbreeding coefficient, .39%, which puts her on the top 20 list of lowest inbreeding coefficient mares. Her mare line is ster+pref, ster, ster, ster. A beautiful Ster mare born March 28, 2002. 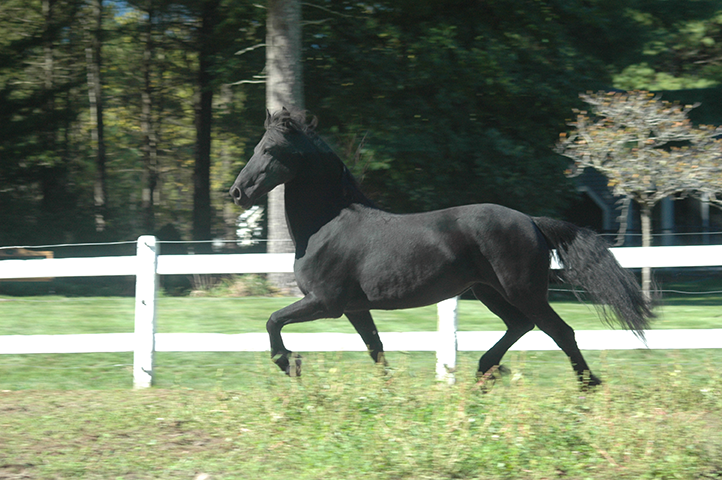 We imported Greta for a client as a yearling. She came back for training for the keur, and stayed after that to continue her training and to start breeding. When her owner decided to sell her, we decided we couldn't part with her! So, she's been with us most of her life. She is from the top stam line 43, with a low 1.05 inbreeding coefficient. She has an amazing mare line: ter, ster+pref, model+pref, model+pref. She has had 2 beautiful kids. A Champion Ster daughter, Asberry H, by Teade 392 Sport. Asberry became Champion of the keur and ster last year, she was also in the top five for the IBOP driving champion. She has been very successful in the show ring thanks to the commitment of owners Tom & Melanie Olajos. Greta also has a beautiful son, Full Throttle ("Fuller"). He was Champion Ster gelding at the keuring, and doing fabulous in the show ring with many championships to his name. He is gorgeous and we couldn't be prouder of him and his owners Bonnie and Joe. Now Greta is 2 for 2 - 2 kids, and both ster, 100% ster offspring - that is something very special. Keeper is out of our mare Bintsje, and we liked her the minute she stood up. Except maybe for her big ears! Thankfully she is growing into them. She is now a coming 2 year old, and we are very happy with how she is turning out. 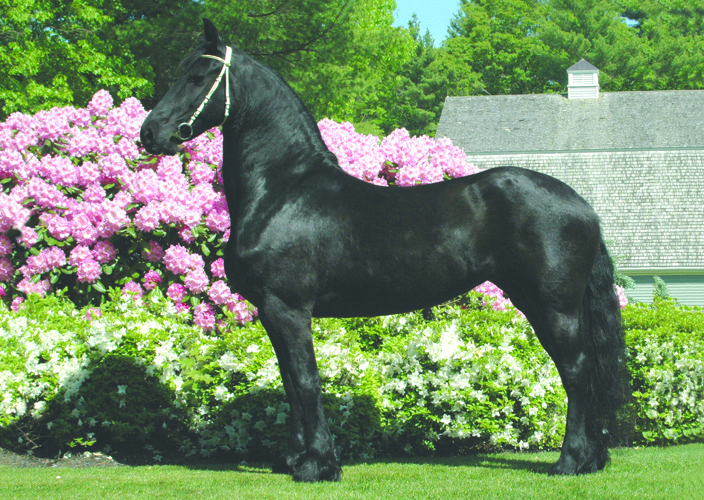 Now owned and loved by Susan Ryan, and staying at Hennigan Friesians. We plan to show her in hand this year, so watch for her in the ring. She has definitely inherited her mother's intelligence, and her sweet and sparky personality. We look forward to watching her grow and mature, and can't wait to see her all grown up! 26 years old and going strong!! She is happy & healthy, living the life of luxury, and having fun with 5 year old Lucy Sullivan. Moike and her half brother Marinus were purchased by the Kent family when they were 4 years old. Moike became Julie's partner, and they had an incredible show career. 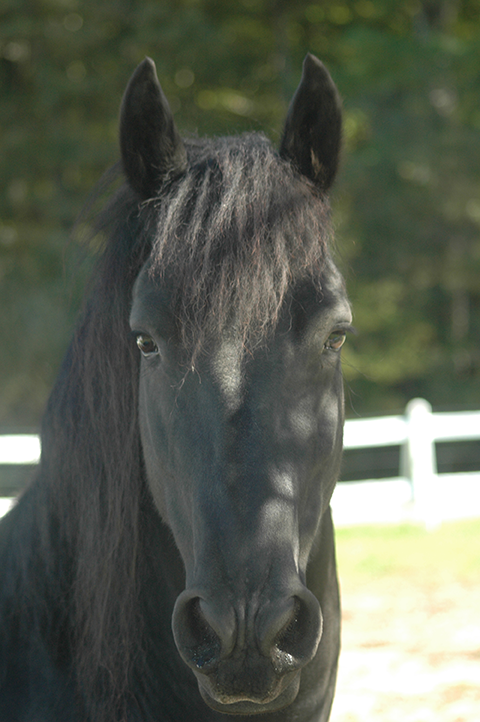 Moike was instrumental in promoting the Friesian breed back when people thought she was a percheron! They are still known as the friesian with the rider wearing the red coat. 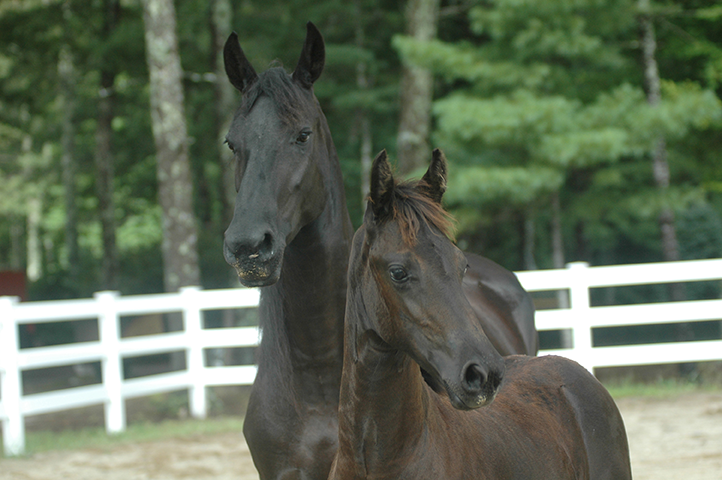 Julie retired her after she won practically everything, to start breeding, and Moike had 6 wonderful foals. She and Julie are lifelong friends, and Moike is as beautiful as ever, even though a little chubby. Moike winning with Julie back in the day!